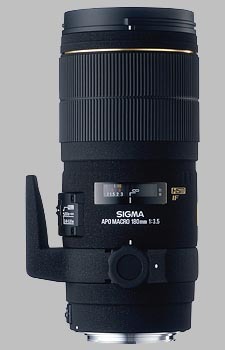 (From Sigma lens literature) The Sigma APO Macro 180mm f/3.5 EX HSM lens has a very narrow field of view, and can allow very narrow depth-of-field for selective focus and less distracting backgrounds. This lens is most desirable for photographers who are serious about producing high quality images both of macro subjects at life-size reproduction, as well as normal telephotography. The Floating Inner Focus System provides high quality optical performance and superior handling and stability. This system moves two lens groups within the lens, so the lens's physical length remains unchanged. This technique also maintains good correction for Spherical Aberration and Astigmatism, and provides extremely high optical performance from infinity to 1:1 Macro. Macro photography requires precise focus adjustment. The HSM (Hyper Sonic Motor) feature is ideal for this purpose as it allows quick and precise manual focus, even in auto focus mode. Simply focus with HSM auto focus, then while partially depressing the shutter release, turn the manual focus ring until any desired focus adjustment is made. Then depress the shutter release fully to take the picture. It is not necessary to switch from AF to MF. When the shutter release is next depressed, the AF function will resume. Of course the AF function can be disabled altogether, and only MF used, if so desired. Macro photography can be further enhanced by the 1.4x APO EX tele-converter, which allows the photographer to use this lens as a 252mm f/5 lens while maintaining auto focus function from infinity to 1.2m (47.2 in.) with Canon, Nikon and Sigma cameras. At distances closer than 1.2m (47.2 in.) the lens automatically switches to MF mode. When this lens and the 1.4x EX tele-converter are used with Minolta or Pentax cameras the lens must be focused manually. When used with the 2x EX tele-converter, the 180mm F3.5 lens becomes a 360mm f/7 lens with manual focus function only, regardless of camera mount. Image quality depends in part on color Aberration, which occurs due to differences in the wavelength (color) of light, causing the different colors to focus at different planes. SLD glass in the front optical group helps compensate for this phenomenon, and enables the lens to deliver images of high optical quality, having outstanding crispness and sharpness. Inner focusing improves handling and focus operation from infinity to close-up, by keeping the lens length constant. It also allows easy handling and use of circular polarizing filters, as the front barrel does not rotate during focusing. The large grippable manual focus control ring is ideal for manual focus photography. This lens also features a Focus Limiter Switch, to provide quicker AF function. I spent a good deal of time reading reviews before I purchased this lens. It proved to be an excellent choice. I get very positive comments on work I've done with this lens. It is built like a tank and is both solid but also a bit heavy. After 3 years of use it shows now wear nor has developed any issues. The longer working distance is very helpful in working with live subjects in the field. It also gives you just a little more focus distance too. The auto focus is slow. Most long macro lens are. This was not an issue for me as I use manual focus anyway. The Canon version of this lens is a bit faster but now what I would call fast either. I shoot this with a canon camera and I've found it to be a very sharp lens. People always remark about how sharp, how much detail and color I get with this lens. As I'm using manual focus a solid tripod is very important. I have shot it hand held but it is a bit heavy for much of that. It really shines when you the effort to use a solid tripod, mirror lock up and a remote shutter release or timer. If the lens is rock solid still, you'll be amazed and the detail you can get. The focus ring is very smooth and is fine enough to allow you to very precisely choose your focal plane. I have used the autofocus features but you want to make sure you have a single focus point and you have put it exactly in the middle of the area you want in focus. As the focal plane get very narrow I love to use the manual focus so I can choose exactly what element will be razor sharp. I've shot this lens right along side others shooting the Canon and Tamron 180's, and usually at the end of the day when we compare shots,we'll all pick the work I've done with this lens. The only advantage I've seen with the Canon is that it has a bit faster auto focus. If you are shooting butterflies in flight that may be important but it comes at twice the price. I purchased this lens before the Sigma 150 hit the market or I might have chosen it for it's smaller lighter build. That's not to say I would trade it now as I've very spoiled with the remarkable results I get with it. I do have the Sigma 2x teleconverter that I use occasionally. This is a nice combination and produces very good result if you need a little more magnification. I can see a very slight degradation in image quality but nothing more that what you would expect from any brand. This is right on the edge of being able to notice it at all. Of course the higher magnification requires even better technique to make sure everything is absolutely still. I am very pleased with this lens and recommend it to anyone look for a cost effective alternative to the Canon 180. I own a non-DG versionof this lens, Pentax mount. Pentax version is driven from the camera body, not a HSM. Still with camera like K-5 the AF is instant and accurate, usable for tracking of flying birds or sports. The optics is first class, no reservations. I beleve it is better buy than 200/2.8 - larger and half stop slower, but also macro and APO. I do a lot of photos in the wild weather and nature. And i really recommend this lens for this kind of use. This is a very convenient macro lens for walking about the countryside. You can shoot anything from tiny bugs to dragon flies to birds. Impressive 1:1 macro without accessory. USM autofocus is nice, but for small bugs I usually use manual focus. It is longer and heavier than the Nikkor 180mm f/2.8, dispite having a smaller aperture of only f/3.5. The tripod collar can be easily taken off to reduce a little weight. The supplied lens hood can be reversed for storage. Strange: In the EXIF files the focal length is stated as 185mm. The working distance from the front lens at full 1:1 macro is 22cm, and at 2:1 (butterfly) it is 40cm. These are good working distances for shy critters. In comparison, at 1:1 the Zoom Micro Nikkor 70-180 has a working distance of 12cm from the front lens, and you even need an extra close-up lens for that. Optically I gave the Sigma an 8, but you should give it the benefit of the doubt; I only shoot handheld and at high ISO speeds. The reason why I'm not 100% satisfied is because I feel that I get more pleasing macro shots with an unusual competitor: an old Nikkor AF 180mm f/2.8 plus extension tube (however, this setup is completely manual). Sharpness of the Sigma seems okay, but maybe the Nikkor has a better bokeh. So, for convenience the Sigma is great. It is also quite robust and has survived many hiking trips.